Look! We got strawberries!! 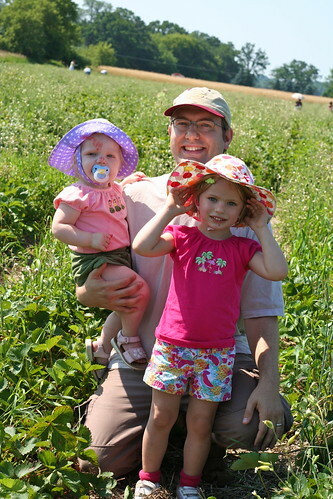 Our first harvest was exactly four--perfect, one for each member of the Baker family. Except Emily is super cute when she does the "mo?" (more) and makes the sign for please. Soooo cute. Irresistible really. Which is how she ended up with three strawberries and Brent and I ended up with none. 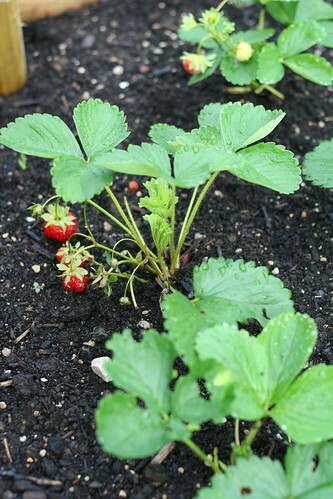 Since the four strawberries were hardly enough to satisfy us, we decided to get our strawberry-piggy selves to a strawberry patch, PRONTO. I guess it was a little late in the season. So there was a lot of foraging. 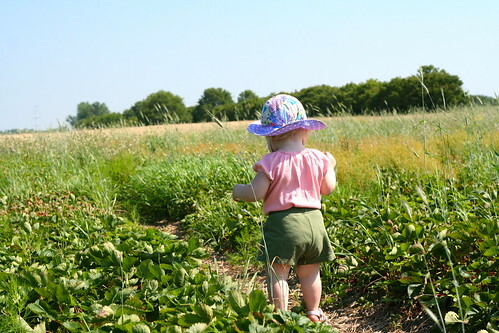 And the whole patch smelled like squashed strawberries. (not a bad thing). 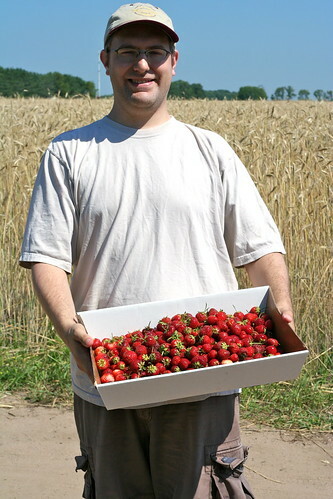 That looks like a ton of strawberries, yes? Like that should last a couple days? Nope. All gone in 24 hrs. We chowed down and made some strawberry-vanilla jam and then we were like, hey, where'd all those strawberries go? I didn't even get to make the traditional strawberry picking crepes with whip cream. We did, however, enjoy the awesomest strawberry, blueberry, and whip cream RED WHITE and BLUE pancakes for fourth of July dinner. Screw you steaks and beer, when I want to celebrate AMERICA I make me some pancakes, bacon, and coffee. 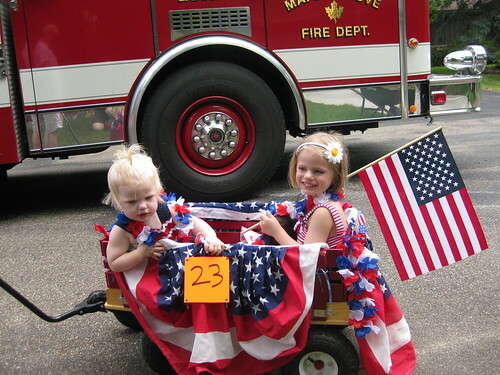 Speaking of the Fourth, want to see some cute pictures? Sure you do! That's why you're here, right? We went over to Brent's sister's neighborhood, where the Fourth is a big deal. Parade, firetrucks, band, bbq, games, the whole shebang. 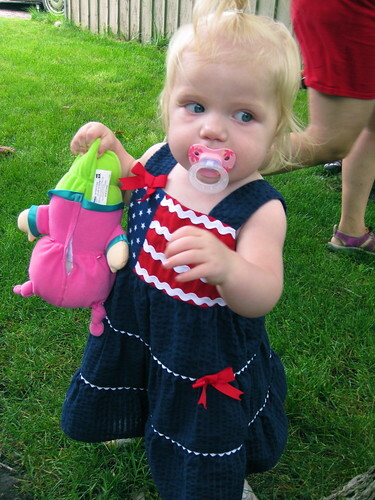 Ok, cute picture #1, Mimi in a flag dress. Ooooh! so cute! And finally, cute picture #3. BRACE YOURSELF for Baker overload. 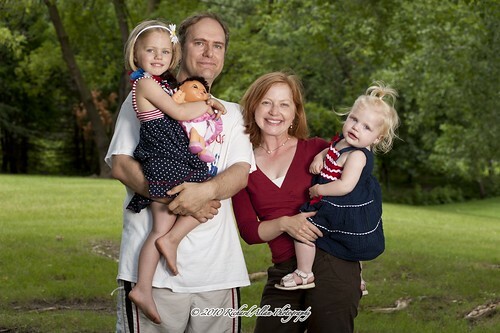 I thought that turned out great--it was taken by a photographer who was trying to promote his business and was just set up at the bbq. Score! We came home, the kids ate an unbelievable (really, you wouldn't believe me) amount of pancakes, then we tucked them in and relaxed on the deck and watched fireworks. Actually to be completely honest, Brent relaxed on the deck and watched fireworks. I got all shutterbuggy and had to set up my tripod and try about 50 different camera settings (don't ask me what worked, I have no idea). But I like that kind of photo-y stuff, so I guess I was relaxing too. We were pretty impressed at the fireworks in the neighborhood. Aren't fireworks expensive? Like how expensive are we talking here? Like $50 for a nice shooty one like above? or more? sheesh. I'd rather have yarn. So I guess my perfect Fourth of July includes babies in flag dresses, lots of playing/dancing/swimming, pancakes, and yarn shooting up in the air. Which means this year was almost perfect!